The Szczecin Cosmology Group was established at the beginning of the 1990s. It is formed mainly of the scientific staff of the Division of Relativity and Cosmology of the Institute of Physics and the Faculty of Mathematics and Physics of the University of Szczecin. Fundamental cosmology based on unified theories of all the fundamental interactions (nuclear strong, nuclear weak, electromagnetic, and gravitational). Varying physical constants cosmologies. Observational and experimental consequences of the variability of physical constants. Superstring and M-theory cosmology. Brane cosmology. Pre-Big-Bang cosmology scenario and superinflation. Ekpyrotic/cyclic cosmology. Horava-Witten cosmology. The notions of the Multiverse and the superstring landscape. Inflation and large-scale structure of the universe. Large extra dimensions. Gravitational waves. Observational verification of the cosmological models (supernovae, baryon acoustic oscillations, cosmic microwave background, redshift drift). Phantom cosmology and phantom duality. Exotic singularity cosmologies (big-rip, sudden future singularities, finite scale factor singularities, big separation, w-singularities). Chaotic cosmology. Dark energy and quintessence. Quantum cosmology and loop quantum cosmology. The structure of space-time singularities. Inhomogeneous cosmology. Scalar-tensor cosmology. Conformally invariant cosmology. 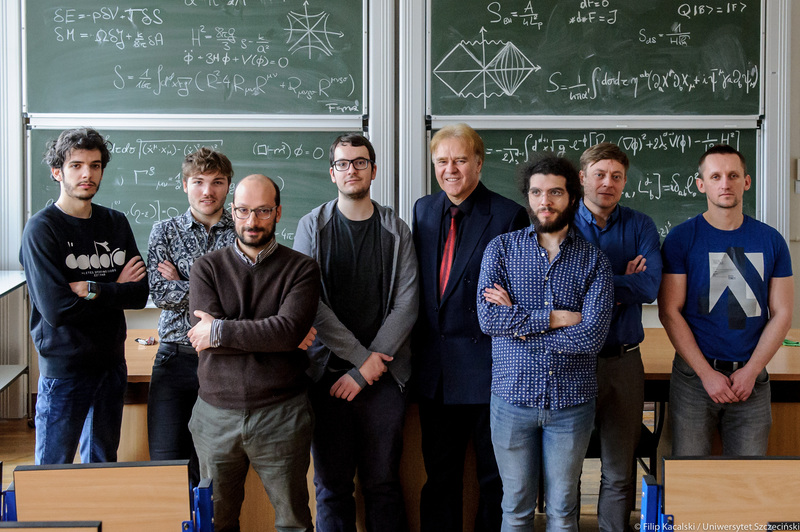 In the years 2013-18 the group was running the project MAESTRO-3 “New consequences of the variability of fundamental constants in physics and cosmology” (No DEC-2012/06/A/ST2/00395). It contains the problems related to the theoretical and observational consequences of timely and spatial variability of the speed of light c, gravitational constant G, fine structure constant α, proton to electron mass ratio and other physical constants. The scenarios of the evolution of the Universe with varying fundamental constants in the context of superstring theory (superstring landscape) and the Multiverse concept are also considered. Gravity Research Foundation has awarded an Honorable Mention in Awards for Essays for 2018 to Ana Alonso-Serrano, Mariusz P. Dąbrowski, and Hussain Gohar for an essay "Minimal length and the flow of entropy from black holes". V. Salzano inteviewed about his work on fundamental constants variability as alternative gravity theories for the CANTATA European Cost Action in which we also participate. Annalen der Physik about inhomogeneities due to spatial variations of the speed of light by M.P. Dąbrowski, V. Salzano, and A. Balcerzak Ann. Phys. 529 (2017), 1600409. Phys.org about our method of cosmological measurement of the speed of light with cosmic rulers and clocks (chronometers) by V. Salzano, M.P. Dąbrowski, and R. Lazkoz Phys. Rev. Lett. 114 (2015), 101304. From left to right: Paolo Cremonese (M. Sc. ), Fabian Wagner (M. Sc. ), Dr. hab. Vincenzo Salzano, Roberto Caroli (M. Sc. ), Prof. Mariusz P. Dąbrowski (head of the group), Samuel Barroso-Bellido (M. Sc. ), Dr. Tomasz Denkiewicz, Dr. Adam Balcerzak, Dr. Konrad Marosek (not present in the photo) , Katarzyna Leszczyńska (M. Sc.) (not present in the photo) .